This is another post in my occasional “Friday Feature” series. Friday Features are published on (surprise!) Fridays, and are longer-form discussions of some aspect of archaeology, history, theory, etc., that doesn’t lend itself to a typical post. Friday Features are archived on a single page, linked at the top, for easy access. Thanksgiving at my house brought a flurry of cooking, a spot of (very disappointing) football, and some quite tasty dinner and wine. But as usual, I had to go and complicate even the most mundane of tasks. During the several hours of meal prep, I wondered more and more about one product in particular: Corn syrup, specifically, Karo brand corn syrup. This ingredient stuck out for two reasons. First, it was integral to the pecan pie – one of my favorite desserts, and one that I make only during the holiday season. My wife and I have two recipes: One for a traditional pie, from my grandmother; one for tiny pecan pie tarts called “Tassies” that’s from my wife’s grandmother. This year, we chose to try a third one that we found online. But in all three, corn syrup is the most important ingredient, at least by volume. There’s more corn syrup than anything else, including pecans. The second odd thing about the Karo was how much it differed from the rest of the ingredients in our dinner. We’re pretty non-traditional when it comes to Thanksgiving – no turkey as a rule, and this year, no meat at all, just veggie sides. And we tend to cook with lots of whole ingredients, so we spent most of Thanksgiving Day peeling sweet potatoes, stemming green beans, roasting walnuts, slicing kale leaves, and so on. Amid all that natural-y stuff, the corn syrup stood alone, with its bright label announcing its ingredients, nutritional information, and place of origin. Glancing at the ingredients, all I learned was it contained “corn syrup.” I’ve been around lots of corn, and I’ve never noticed it to be particularly syrupy. So I investigated. I wanted to know what corn syrup was, where it came from, who made it, and why it’s so ubiquitous. Here’s what I found out. In order, I’ll discuss corn syrup itself, the Karo brand’s corporate owners, and how this particular commodity ended up in my pie filling. In 2011/2012, the U.S. imported 3.2 million metric tons of raw cane sugar and produced 3.2 million metric tons, mostly in Florida and Louisiana (For simplicity, I’m excluding beet sugar, though it accounts for even more U.S. sugar production). Historically, most U.S. sugar imports have come from the Philippines, Brazil, and the Dominican Republic. The U.S. protects domestic sugar growers and producers through tariffs and subsidies and import quotas (all summarized here and here). That has certainly helped increase domestic production, but, simply put, we sweeten so many things that domestic sugar alone can’t supply it all. Hence, corn sweeteners. In terms of glucose syrup alone, U.S. manufacturers produced 4 million short tons in 2011, imported virtually none, exported just a fraction, and sent half of that production to food and beverage use. For HFCS, the numbers are even higher: 9.1 million short tons of production in 2011, of which the vast majority went into foods and beverages. Compare that with 5.5 million short tons of refined sugar in 2011 earmarked for “industrial use” (i.e., everything except the sugar you keep in the pantry or use at your local coffee shop), and it’s clear that domestic sugar is a small chunk of the U.S. sweetener landscape, with corn products owning the lion’s share. And in terms of consumer-level corn syrup, in the U.S., the market pretty much belongs to Karo. 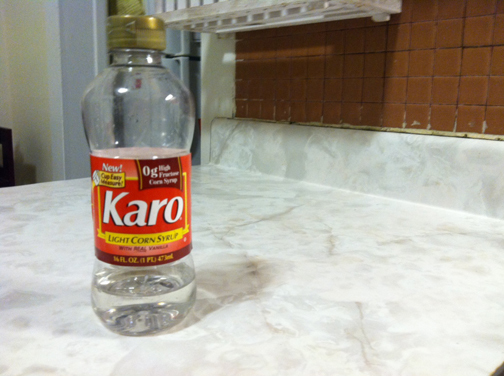 The Karo label tells me the bottle is a product of ACH Food Companies Inc. of Memphis, Tennessee. ACH makes a range of food products, including Fleischmann’s Yeast, Spice Island spices, and Mazola oils, in addition to Karo. Helpfully (and somewhat troublingly), its Web site notes that “under no circumstance does ACH support or condone the use of forced or slave labor for any human being, especially children” (source). ACH, though, is itself part of a larger corporate structure. It is a U.S. subsidiary of Associated British Foods plc, one of the world’s largest producers of sugar products and baking yeast, with retail stores in Europe and private label brands including Twinings and Ovaltine (outside the U.S., where that brand is owned by Nestle). Associated British Foods might sound familiar, as it has been in the news recently. Earlier this year, the company denied charges that another subsidiary moved profits out of Zambia to avoid paying corporate taxes (see the report, media accounts, and corporate responses linked here). More recently, Oxfam has alleged that Associated British Foods and other companies have knowingly worked to seize land from indigenous groups around the world. That corporate connection isn’t obvious from the Karo label. And that’s by design. Part of the mystery of commodities is the radical separation that they seem to create between production and consumption. To put that another way, consider the way we make purchases. We go to a supermarket and are confronted by things to consume – things that appear to simply exist in finished form. The little act of buying obscures the long train of steps involved in making, distributing, and marketing commodities – steps that involve vast networks of interconnected people at each stage. We confront that train only at the endpoint, and it takes work to piece together the steps leading up to it. At the point of purchase, though, I was concerned only with getting the right product, and, to a lesser extent, with cost. Because the whole commodity chain is obscured, we end up thinking that the cost of a product appears only at that moment of purchase. The fact is, there are costs associated with each link in the chain, and many of those costs are not directly economic ones. Neither my nor my wife’s grandmother knew or cared anything about ACH foods, tax dodging allegations, or global trade policy. They just knew how to make really great pecan pies. And the key to both their recipes was Karo corn syrup. But why corn syrup and not sugar, or honey, or maple syrup? Because they cooked the way they had been taught to cook, using ingredients that were broadly available and relatively cheap. So why is corn syrup widely available and relatively cheap, and how long has it been that way? In 1921, crystalline dextrose hydrate was introduced. Then in the mid-1950′s, the technology for commercially preparing low conversion products such as maltodextrin and low DE syrups was developed. 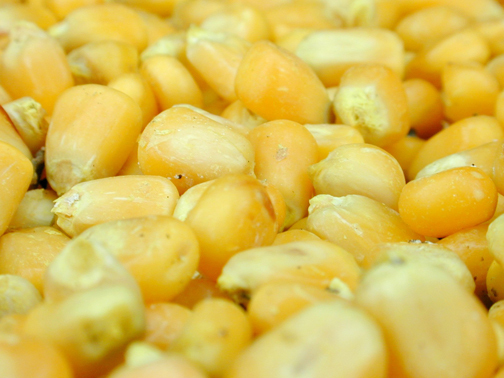 The purification and crystallization of dextrose meant for the first time that corn based sweeteners could compete in some markets that had been the sole domain of the sugar industry. Statistics from the USDA Economic Research Service reveal the impact of corn syrup over time. Per-capita sweetener use, in pounds, was 119 in 1970, of which refined sugar accounted for 101 and glucose syrup for nearly 11. By 2000, per-capita use stood at nearly 149 pounds, with refined sugar accounting for 65, glucose syrup 15, and high-fructose corn syrup, 62 (the numbers are summarized in a simple format here). Of course, it is possible to make something similar to corn syrup – thick, sweet, and liquid – for cooking purposes, by boiling cane sugar in water, stirring, and chilling the liquid. That, though, is time-consuming, and in the past few decades would have become increasingly more expensive relative to corn syrup, due to increasing supply of the latter. Time and cost, then, work to favor corn syrup for this particular kitchen application. Moreover, in cooking, there is an issue of taste and texture. Using sugar in place of corn syrup for this pecan pie would … well, I don’t know what it would do, simply because I’ve never tried it. I can imagine it would turn out runny and somewhat granular. That’s not necessarily bad, but it’s not how I remember my grandmother’s pies or my wife’s family’s Tassies turning out. That’s more important than it might seem: Part of the allure of using a handed-down recipe is the sensory delight of tasting something from our past, and the intangible joy that comes from cooking “like granny did.” Our tastes are formed in childhood. As adults, we can re-enact the rituals that result in that remembered taste – it’s a powerful, multi-sensory, embodied sort of practice that’s deeply satisfying on many levels. What likely began in past generations as a convenience and cost-control measure has become, over the years, simply the way this recipe is done. That conclusion, though, hides the complex network of politics, trade, and economic factors that lurk behind this simple commodity. To say I was shocked that what seemed to be a simple purchase in fact connected me to a host of people and processes that stretch around the world and through time would be an understatement. Surprise led to analysis, which I’ve presented here (in obviously a simple, and probably overly simplistic, form). If this reads like a call to boycott Karo, then I haven’t been clear. It’s overly simplistic to say the solution to all the problems associated with capitalist provisioning can be solved by consumer boycotts, or even by hyper-local consumption. While both of those are probably good ideas, they don’t address the root problems here: a bottom-line focus in food production; rising prices combined with globally low wages; and the tendency to act as though we’re all radically unconnected to other producers and consumers. In other words, a real solution will have to take production and other social factors into account, as well as consumption. Having said that, there’s value in educating ourselves about corporate food connections and the ways the commodities we consume are produced and distributed. The trick lies in translating knowledge into change, and that takes collective action on many fronts – political, economic, and social. ← Reflection time: Why blog about archaeology? I am a person who is fascinated by the origin of the foods we eat. Thank you for such an eye opening post.